Alex Rixon-Booth’s strong focus and commitment to the benefits of volunteering has seen him establish and develop I Need Helpers as an industry leader and platform supporting events. His strong involvement and unique perspective on volunteer management has been utilised by the Victorian major events industry, setting new benchmarks in the successful planning and delivery of volunteer programs. Alex currently holds a qualification in Event Management completed at William Angliss Institute and continues to volunteer for a variety of events across the Victorian events calendar. His background in event management has seen him involved first hand within our industry and working closely with the many event venues our city has to offer including Government House, Melbourne Convention & Exhibition Centre, Federation Square and the Royal Exhibition Building. Whilst studying Alex was actively volunteering, which subsequently landed him full-time employment within the Victorian major events industry and later sparked the idea of creating a platform for students seeking career-developing opportunities. In 2010 he established I Need Helpers and has since overseen the volunteer management of many Victorian events which include Melbourne Food & Wine Festival, St Kilda Festival, Eureka Climb, Financial Education Summit – featuring Sir Richard Branson and many more. 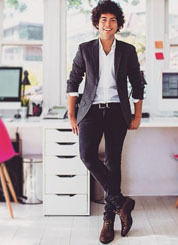 His first business venture was in 2008 with the publication of his own magazine / directory for the retail shops of the Chapel Street precinct titled Chapel Street – Restaurants, Bars, Cafes & Retail, which gained endorsement from the Chapel Street Precinct. A percentage of profits was donated towards the Prahran Mission charity organisation assisting those who are experiencing homelessness, the effects of poverty, mental illness or physical disability. Following his passion for developing and driving business concepts, he sought and gained funding from National Youth Week and the City of Maribyrnong to host a culturally and linguistically diverse (CALD) focused music event at the Footscray Community Arts Centre in 2009. Alex’s work demonstrates a strong commitment to building a community by creating platforms that link students with industry and provide educational gain. This connection will continue to elevate education across Melbourne event courses and develop the way our Melbourne event managers plan and operate their events. Alex has recently introduced additional services under the core volunteer coordination service, now supporting marketing, public relations and photography students to gain industry exposure. His future plans to build and expand I Need Helpers whilst personally being involved in the Melbourne event industry will see this organisation flourish.